observations: Should be read with this entry. The centenary of Barbara Pym's birth is being celebrated this month. When people say Barbara Pym is like Jane Austen you want to ask them if they’ve actually read Jane Austen, or if they think all single women who write novels must be the same. Barbara Pym is wonderful, but not in a Jane Austen kind of way. Not a great deal happened in Pym’s life (in that respect she is like Austen), apart from some unresolved and unsatisfactory love affairs, and a job that she seemed to enjoy – but her diaries, letters and biography make for unexpectedly riveting reading. As we said in the previous entry, Dulcie’s ‘researches’ aren’t much of an exaggeration from her own activities. Links on the blog: Dulcie’s neighbour is very keen on getting everything delivered from Harrods – just like one of the residents at the Hotel du Lac. Pym's Excellent Women is here. 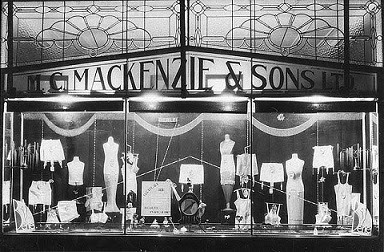 The photograph of a shop display is from the State Library of New South Wales.